Our new Easy Fast Sequential Injection system – is the latest technology for LPG gas conversions. 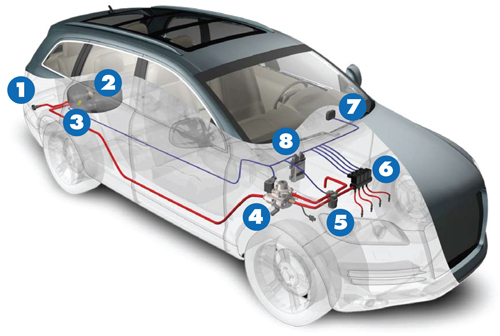 Designed for later model vehicles, Easy Fast integrates with the engine management system – and injects the LPG into the engine in the same way as petrol. This provides uncompromised performance, and outstanding fuel economy. The only difference you’ll notice – is when paying less at the service station – and in knowing you are helping the environment. inside the petrol filler cap. the hole for the spare tyre, but cylindrical tanks are also used. build up in the tank . into the car (not necessary when the tank is mounted out side the car). when the engine is switched off. cylinder via injector operated in phase with the motor. of gas held in the tank using a series of LEEs. automatically to petrol and alerts the driver with a bleep.